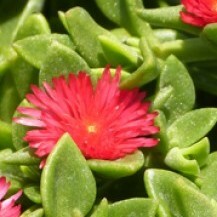 Aptenia cordifolia, commonly known as Heartleaf Iceplant in the Midwest, is a plant native to South Africa and widely used in rock gardens or planted en masse 2 ft. apart for a solid groundcover. Fleshy green leaves contrast well with the bright red flowers. Cold hardy to Zone 9.